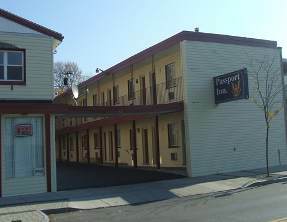 Located in heart of the tourist area of Niagara Falls, New York is the Passport Inn Motel on 3rd Street. This Niagara Falls USA Motel is only a short walk to the American Falls and the surrounding attractions, as well as the attractions located in Niagara Falls Canada. Each of the 18 motel guestrooms features in room televisions, queen or double beds, a mini fridge and microwave, heart shaped jacuzzi suites are available, telephones and all rooms are air conditioned. The Passport Inn Motel offers guests with ideal location to great restaurants and lounges, outlet mall shopping and major attrractions in Niagara Falls New York.